I hope you are having a beautiful day … Sunday’s are always a favorite of mine, they just seems to be more relaxing. Yesterday I shared a card from the Delightful Daisy bundle, and although the bundle is not available at this time, there are plenty of other goodies in this product suite that you can play with. Today we are going to see more of the Designer Series paper. The Delightful Daisy Designer paper has so many beautiful patterns that can be used year round (You’ll see what I mean tomorrow!). 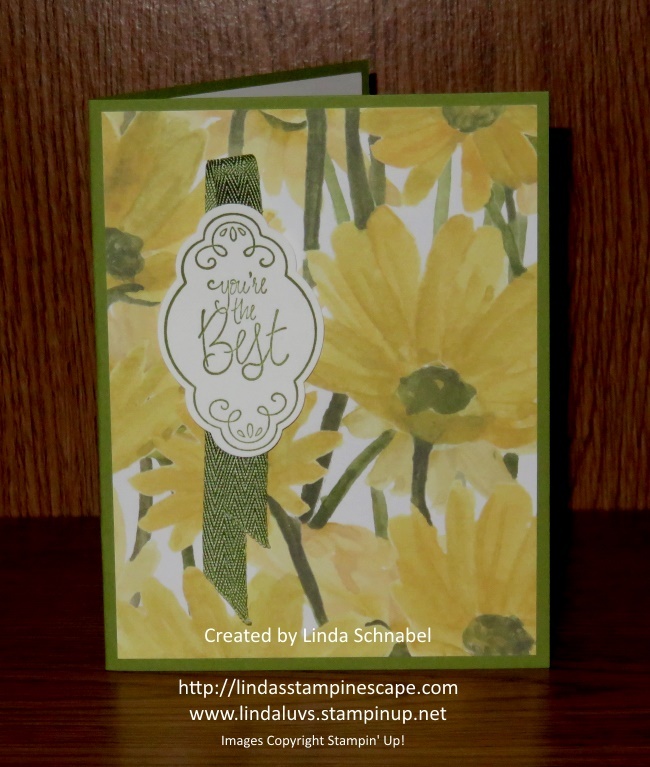 This beautiful patterned paper with the big yellow daisies create the perfect background for a quick -n- easy card. I teamed up the paper with the Label Me Pretty bundle. This is another new bundle that can be used for so many different projects. I tucked a strip of the new Old Olive Mimi Chevron ribbon … you will find this in the Color Theory Suite. So many of the new stamp sets and product suites coordinate so nicely together! Well I’m off so you can enjoy your Sunday … thank you for sharing part of yours with me. Thank you Bernice for sharing your thoughts, and I totally agree with you!